What is a Mehrfachfrankatur, a Massenfrankatur, a Buntfrankatur or a Mehrfachbuntfrankatur? This note seeks to help those puzzled by the descriptions used in German-language catalogues. There is however no Bundesgesetze or even Postverordnung prescribing these meanings. Caveat Emptor, and always check the actual item or its picture. An item cancelled with more than one copy of the same value of the same issue and nothing else (eg a pair of 2 heller) is a Mehrfachfrankatur. If you want it to have a large number (eg 10, or indeed 77) of copies of the same value of the same issue, you need a Massenfrankatur. 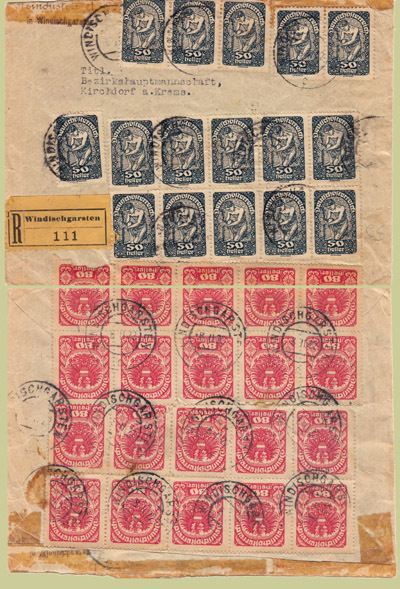 Purists add that it must have no other stamps; realists go by the general impression it makes. 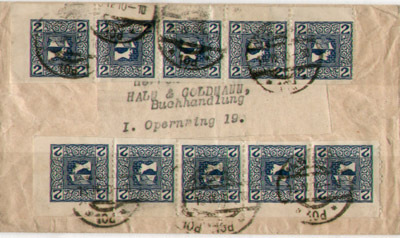 For an item with at least two stamps of the same issue but with different face values, eg 2h & 4h, ask for Buntfrankatur. Note that Mehrfachbuntfrankatur is used by Ferchenbauer for a Bunt with at least two copies of at least one value. Bunt overrides Mehr, so this cover with three of 1S and a 40g is a Bunt. Massen overrides Bunt, so "10 copies of a 2h plus a 4h" is a Massenfrankatur. This is decidedly a Massenfrankatur! 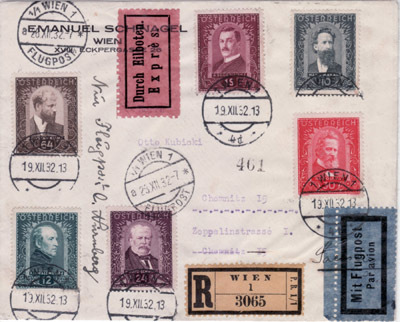 This item is either a (Mehrfach)buntfrankatur or a Philatelic Concoction, depending on your collecting tastes. 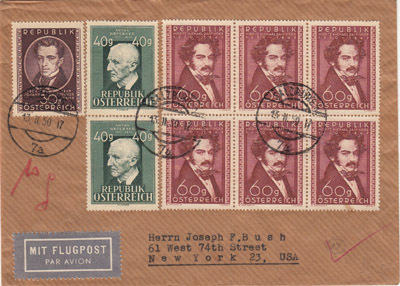 This cover carries the "Austrian Painters" set. 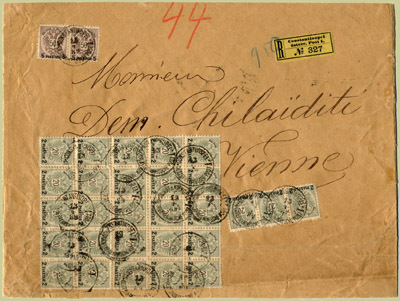 It was sent from Vienna to Germany, registered & express & by air. It's a Buntfrankatur. 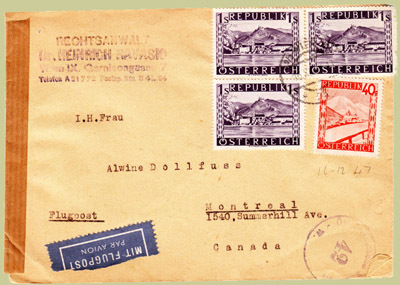 This cover, franked at 66 piasters made up by twenty-eight 2-piaster and two 5-piaster adhesives, is a Massenfrankatur.